Take a tour of the most famous recording studio in the history of Rock N’ Roll. Sun Studio has produced more well-known musicians than any recording studio in the world. You won’t find this kind of memorabilia anywhere else. This studio is where country music and the blues came together to create an entirely new genre of music-Rock N’ Roll! 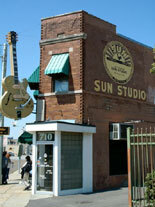 Go back in time and see it all for yourself in a Sun Studio guided tour. The tour provides you with the opportunity to hear outtakes from historical sessions, including the first microphone session with Elvis. You will have the chance to re-live history and see tons of memorabilia that launched the music careers of such greats as Carl Perkins, B.B. King, Johnny Cash, Little Milton, Charlie Rich, Roy Orbison, Rosco Gordon, Howlin’ Wolf, Elvis Presley, Jerry Lee Lewis, and many other legends. It has been 50 years since the ‘Million Dollar Quartet’ first held a jam session and recording at Sun Studio. That jam session, featuring Carl Perkins, Johnny Cash, Elvis Presley, and Jerry Lee Lewis remains one of the most iconic moments in musical history. The Sun Studio Special Anniversary Tour features music and memorabilia to highlight the lives and careers for these world-famous music legends. The tour will also celebrate the designation of the studio as a National Historic Landmark in Memphis by the National Park Service. Sun Studio is the only recording studio to receive this honor. The Sun Studio tour is the only place where you can truly appreciate the rich musical heritage for which Memphis has become so well known.